Washington, April 11: About four million children, globally, develop asthma annually because of inhaling nitrogen dioxide air pollution, a recent study has revealed. According to the study, the largest burdens related to air pollution was found in China followed by India. The study published in the journal Lancet Planetary Health is based on data from 2010 to 2015, estimated that 64 per cent of these new cases of asthma occurs in urban areas. London Becomes First City in The World to Implement 24x7 Pollution Charge Zone. The study is the first to quantify the worldwide burden of new pediatric asthma cases linked to traffic-related nitrogen dioxide by using a method that takes into account high exposures to this pollutant that occur near busy roads, said the senior author of the study, Susan C. Anenberg." Our findings suggest that millions of new cases of pediatric asthma could be prevented in cities around the world by reducing air pollution," said Anenberg. "Improving access to cleaner forms of transportation, like electric public transport and active commuting by cycling and walking, would not only bring down NO2 levels, but would also reduce asthma, enhance physical fitness, and cut greenhouse gas emissions," added Anenberg. The researchers linked global datasets of NO2 concentrations, pediatric population distributions, and asthma incidence rates with epidemiological evidence relating traffic-derived NO2 pollution with asthma development in kids. They were then able to estimate the number of new pediatric asthma cases attributable to NO2 pollution in 194 countries and 125 major cities worldwide. 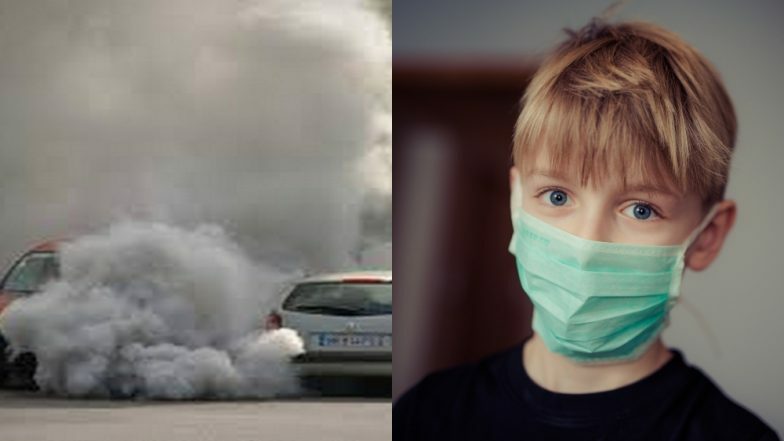 Key findings of the study: An estimated four million children developed asthma each year from 2010 to 2015 due to exposure to NO2 pollution, which primarily comes from motor vehicle exhaust. World Asthma Day 2018: How Each Season Can Trigger and Worsen Asthma. An estimated 13 per cent of annual pediatric asthma incidence worldwide was linked to NO2 pollution. Among the 125 cities, NO2 accounted for six per cent (Orlu, Nigeria) to 48 per cent (Shanghai, China) of pediatric asthma incidence. NO2's contribution exceeded 20 per cent in 92 cities located in both developed and emerging economies. The top 10 highest NO2 contributions were estimated for eight cities in China (37 to 48 per cent of pediatric asthma incidence) and for Moscow, Russia and Seoul, South Korea at 40 per cent. The problem affects cities in the United States as well: Los Angeles, New York, Chicago, Las Vegas and Milwaukee were the top five cities in the United States with the highest percentage of pediatric asthma cases linked to polluted air. Nationally, the largest burdens related to air pollution were found in China at 760,000 cases of asthma per year, followed by India at 350,000 and the United States at 240,000. Asthma is a chronic disease that makes it hard to breathe and results when the lung's airways are inflamed. An estimated 235 million people worldwide currently have asthma, which can cause wheezing as well as life-threatening attacks. Obesity Increases Asthma Risk in Children: Study. The World Health Organization (WHO) calls air pollution 'major environmental risk to health' and has established Air Quality Guidelines for NO2 and other air pollutants. The researchers estimate that most children lived in areas below the current WHO guideline of 21 parts per billion for annual average NO2. They also found that about 92 per cent of the new pediatric asthma cases that were attributable to NO2 occurred in areas that already meet the WHO guideline. "That finding suggests that the WHO guideline for NO2 may need to be re-evaluated to make sure it is sufficiently protective of children's health," said Pattanun Achakulwisut, lead author of the paper. The researchers found that in general, cities with high NO2 concentrations also had high levels of greenhouse gas emissions. Many of the solutions aimed at cleaning up the air would not only prevent new cases of asthma and other serious health problems but they would also attenuate global warming, Anenberg said. Additional research must be done to more conclusively identify the causative agent within complex traffic emissions, said the researchers. This effort, along with more air pollution monitoring and epidemiological studies conducted in data-limited countries will help to refine the estimates of new asthma cases tied to traffic emissions, Anenberg and Achakulwisut added.